I'm not sure what is wrong with me! I've been knocked down and I can't get up. I'm down-- really, really down. Yet I have no reason to be down. When I think logically, I know I am a very blessed person, but I'm not always able to think logically. I try! But I usually fail. You're never going to keep me down"
I am trying to get up! This February, Ashley, Cami, and I had lots of fun making baby blankets! My two sisters and my sister-in-law recently had babies! Being the non-sewer that I am, I decided if ever there was a time to celebrate and give sewing another try, now was that time! Ashley and Cami love to sew, so they were thrilled by the idea. It was a rewarding experience working on this project with my two oldest daughters. These are the blankets we made for Makinlee, Gilbert, and Rodney. And we didn't stop there! The sewing continued. We signed up for Disney's Give a Day, Get a Disney Day and the service we chose was to donate blankets to the Linus Foundation. 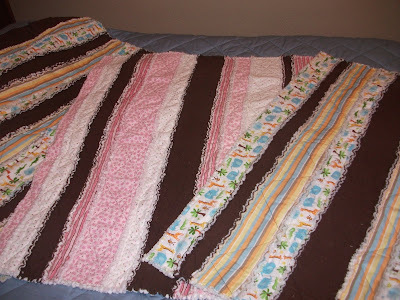 My first thought was to make the easy no-sew fleece blankets. But fleece was more expensive than flannel and we would have had to donate 2 fleece blanets for each person instead of just the 1 flannel blanket. So we sewed some more, 8 more. (Make that 9, we gave one as a gift to Marye Eby for her little Porter.) They turned out super cute, even if I do say so myself. 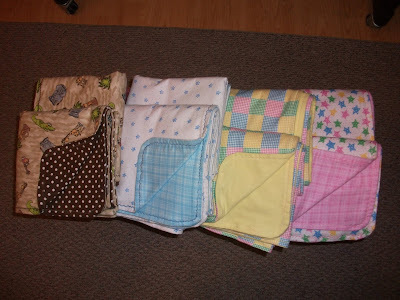 Here are the 8 baby blankets we donated for our day at Disney Land! Thank you, Ashley and Cami for all of your help sewing. Perhaps we should find another project to work on together! Another one of my New Years Goals is to take better care of my body. Heavenly Father has blessed me with a wonderful body but I am sorry to say I have abused it for years, although not intentionally. In the March 2008, General Young Women's Conference Sister Dalton,then a counselor in the YW's General Presidency (now the President), spoke about the importance of taking care of our bodies. She said most, if not all of Satan's attacks are directed at our bodies. He wants to get us addicted and cause us to defile our bodies. I hadn't really thought about that but I see that it is true. I don't smoke, drink or use drugs but I have given in to the temptations of overeating, eating the wrong kinds of foods, and neglecting to exercise regularly. This has impacted how I feel about myself and how others see me and therefore has affected my service to my family, others, and Heavenly Father. Satan is sly. Overeating doesn't seem so bad and yet it hurts my temple, the house of my spirit. I am going to stop letting Satan get me on this one! I am going to repent and ask Heavenly Father to help me change! I am going to take care of the precious gift Heavenly Father has given me: my body and become a better instrument in His hands! 1) Fully live the Word of Wisdom-not just the "don'ts" but the "dos" too! That means whole grains for me- no more of the empty calorie white stuff, LOTS of veggies and fruits, and meat sparingly. Along with the white flour and rice, I'm cutting out refined sugars, too. I want to walk /run 1000 miles in 2010! Lofty I know, especially since I only managed to walk 12 miles in all of January-it was too cold - that is my lame excuse! I want to run a 5k, I'm thinking the Running With Angels 5k . I read Pamela Hansen's book by the same title several years ago and loved it! Now I want to follow her example. And I want to master Jillian Michael's 30 Day Shred! I tried it for the first time this morning and I could hardly do level 1! It was only a 20 minute workout, that was even cut a little short because Faith pushed a button. I was all too happy letting her skip me to the cool down! It was a challenge! Josh did it last night and warned me that it was hard (of course he used 15 lb. weights and the weights I used were only 3lbs). I've got a long ways to go to master all three levels of this video workout but I can imagine how much better I'll look and feel when I do! I've had a lot of fun eating more healthy during January. I've tried some new foods like tofu, sweet potato soup, flax seed, and brussel sprouts. I've made bread with a mixture of whole grains . Who knew I could and should make bread with other grains besides wheat? I've grown and eaten bean and radish sprouts and I now feel a sense of accomplishment when I eat a serving of spinach for breakfast either blended in my berry smoothie or scrambled in my eggs. I've never been good at eating my green leafy vegetables before. My focus for February is to continue the healthy eating while eliminating the unhealthy. I told the kids and Vaughn I was going the whole month without sugar or soda. The kids will hold me to it! Thankfully February is the shortest month! I'm also tackling my lack of exercise problem! I've got to start logging the miles, training for my 5k, and making some progress in my fitness with Jillian. Here's to a healthy month of February! I found this great quote on a blog I often visit: ...and Spiritually Speaking. If it hasn't worked out, it's not the end." I got a good chuckle out of this ...and yet I think it might actually be true! Sometimes I feel like things will never work out but looking back I see they do. I've been thinking a lot about goals this January. In the past I've set a lot of goals and achieved some of them. Sometimes, discouraged by my lack of progress I've temporarily given up on striving towards my goals. Ultimately, I know that goals are key to helping us reach our potential as children of God so I've set myself some lofty ones. Since this blog is about me --Holly's Times, and since I'm going to be intently focusing on my goals, I've decided to blog about them. I'll do it in installments otherwise this post would be way too looooonnnnng! First and foremost I've decided that I want to be like the prophets, Enoch and Abraham. " Enoch walked with God" (Genesis 5: 22, 24) and Abraham "[sought] to be a greater follower of righteousness and to possess a greater knowledge" (Abraham 1:2) . This is what I want!!!!!! I want to walk with God. I want to be a greater follower of righteousness and to possess a greater knowledge. Pray more, pray a lot, pray, pray, pray. I'm going to pray on my knees, I'm going to keep a prayer in my heart. I'm going to stop hearkening to the evil spirit and neglecting to pray. I am going to pray! While thinking about how to improve the quality and effectiveness of my prayers I realized that I have taken the awesomeness of prayer for granted! If I were given the opportunity to have an appointment with someone of importance in the world, I would prepare for my appointment. I would write down the topics I would like to discuss with this person so I wouldn't forget and during the interview I would be sure to take notes. When I pray I have the opportunity to talk not to an imperfect mortal, but to an Omnipotent God who knows all things! And yet, inspite of this wonderful blessing of being able to talk with God whenever I want, I have fallen into the trap of vain repetitions and an often meaningless ritual. With a prayer journal I hope this can change. I will write down those things that I want to talk over with Heavenly Father so I don't forget and I will listen and record the promptings I receive. Record for my posterity the meaningful experiences I have had with prayer. Remembering these experiences will help strenthen my faith and possibly help my posterity. Making the effort to record them may also show Heavenly Father how much I do value these experiences and then perhaps He will bless me with more! Study, study, study the scriptures and the words of the prophets. I want to become a gospel and scripture scholar. The definition of scholar is "a learned person; someone who by long study has gained mastery in one or more disciplines". I don't want this for show but to show God I value His word and to know Him better. In summary, I see these aren't really new goals: praying and scripture study-they are the basics that I have been trying to do all of my life, but I am still excited to rededicate myself. It will be awesome to strive to be like Enoch and Abraham! And what could be more wonderful in this life than to walk with God and be a great follower of righteousness and possess great knowledge?! I'm off to post these on my mirror so I won't forget! I cleaned out the fridge this morning and found a lot of apples that no one wanted to eat anymore due to a bruise here or a blemish there. I googled" healthy apple recipes" and stumbled upon a great website : Meal Makeover Moms http://www.mealmakeovermoms.com/. It is my New Year's Resolution to eat more healthy, AND (even harder), help the kids and Vaughn to eat more healthy! Meal Makeover Moms may be a great tool in helping me achieve my goals. Preheat the oven to 400°F. Combine the apples, brown sugar, flour, vanilla, and cinnamon in a large bowl and toss to coat. Gently toss in the blueberries. Place the apple mixture in an 8 x 8-inch baking dish and set aside. To make the topping, combine the walnuts, oats, brown sugar, whole wheat flour, flaxseed, cinnamon, and salt in a medium bowl. Add the canola oil and stir until the dry ingredients are well coated. Spread the topping evenly over the fruit mixture. Bake 40 to 45 minutes, or until the fruit is tender and the topping is golden brown (cover with foil if the topping browns too quickly). Serve with lowfat vanilla frozen yogurt or a dollop of light whipped cream. 2009 has come and gone. It has been a good year for our family, perhaps a tad too busy for my liking and that explains my lack of blogging, but looking back I see how truly blessed we have been. January found me happily caring for my sweet newborn baby Faith (and recuperating from a C-section). I tried to keep everything else to a minimum so I could have plenty of time to just enjoy my baby! In February we blessed Faith, said our last farewells to Great Grandma Spendlove, who returned shortly after to her heavenly home, and celebrated Xiaoyi's (our foreign exchange student from China) 16th birthday! We also had the privilege of going as a family to the Draper Temple Open House. It was a neat experience for Vaughn and me to share with our children and non-member Xiaoyi the beauty and importance of the temple. I attempted to participate in our neighborhood's Biggest Loser Challenge but I found it to be frustrating because I couldn't make enough time to exercise! I struggled to keep up with nursing a newborn, caring for 8 other children (Xiaoyi included), the housework, laundry, and meal preparations. By March I figured out how to make time for walking. Vaughn and I had a contest to see who could log the most miles on our ipods with nike plus. I had to be creative and entertain Enoch and Faith in the stroller while I walked, or get up super early, or walk after everyone was settled for the night. I logged 72 miles, not enough to beat Vaughn, who had LOTS of free time to walk ALONE, but an accomplishment nevertheless! I still struggled with my daily chores but the walking helped me to feel good in spite of being overwhelmed. Bad weather interfered with my walking and in April I struggled with depression. (I should learn from this!!!!) As Activity Committee Chair I pulled off a successful ward Easter Egg Hunt with LOTS of help and support from my awesome committee. I felt better in May but I longed for solitude-a luxury not easy to come by as the mother of 9 (including my Chinese daughter)! Enoch turned 3 in May! (Amazingly enough I even posted about it.) Josh turned 14! And Ashley received two awards at Maeser's Award Ceremony: Top Latin Student and 11th Grade's Top Socratic Seminar (History and English) Student! Another highlight of May was our annual family vacation to Bear Lake over Memorial Day weekend. As always it was a lot of fun to stay in Grandma's and Grandpa's house and play and swim with all of the Kearl family. June brought relief from the stress caused by school (except for Cami's summer school) but it was still a busy month. Rebekah had a birthday and turned 7! We took a little day trip to Silver Lake. Rachel went to Bear Lake with Aunt Amy for a week. Xiaoyi returned to China. Uncle Will and his friend Steve came to visit from Texas and took everyone (but Grandpa and Grandma Spendlove-they were still in Europe) to dinner at KFC! I was in charge of a ward breakfast in conjunction with the primary's bike parade. Ashley, Cami, and Josh went to Youth Conference. Josh had Scout Camp. We helped build our ward's float and then we (Vaughn and I) were put in charge of getting it to and from the parade route (not an easy feat just ask Vaughn) and making sure we had enough people to pull, ride on, and walk with the float for the two Lehi parades. I was really grateful to have that whole project done!!! And Grandma and Grandpa Spendlove returned from their mission to England! July brought a trip to Yellowstone for Josh with the young men and leaders; a Spendlove family visit to the Oquirrh Mountain Temple Open House; my Seminary Council Reunion mainly made possible due to Facebook; girls camp for Ashley, Cami, and Vaughn. (Yes, Vaughn, he loves to volunteer at girls camp as a priesthood holder every year); our 19th wedding anniversary; a Kearl family cookout in the mountains; an awesome Spendlove family vacation including a day spent enjoying the amusements of Park City and a camp out at Heber Valley girls camp. July was a fun month! We began August at Bear Lake for Raspberry Days and lots of time at the beach! I found my turns on the wave runner to be exhilarating! Our last blast of summer fun was a spur of the moment camp out in the backyard. Vaughn and Faith passed on this one but the rest of us had lots of fun! The rest of August was spent preparing to go back to school-lots of school shopping, assessments, and meeting of teachers and then all too soon school was in session. Also in August was the blessing of being able to attend the dedication of the Oquirrh Mountain Temple and the surprise of ward boundary changes, we suddenly found ourselves in a new ward. September brought Cami's 16th birthday and her first date to Maeser's Homecoming Dance! It was also the month I trained at Velocity during their Pound for Pound Challenge (Velocity donated 1 pound of food to the food bank for every 1 pound we lost.) I lost 6 pounds and saw a lot of fitness improvements. It was a lot of hard training but I loved it! In October we got to go as a family to Vaughn's mission reunion and meet Elder Neil L. Anderson of the Quorum of the Twelve, Vaughn's mission president in Bordeaux, France 20 years ago; Ashley retook the ACT test after MUCH preparation and improved her score by a considerable amount; Cami, Josh, and I biked the Provo trail with Grandpa Spendlove; and of course we celebrated Halloween! November was a birthday month: Rachel turned 9, Ashley turned 18, and Vaughn turned 29 again! Cami's good friend, Jared died and we mourned his passing. We celebrated Thanksgiving with the Moore and Kearl families and keeping with tradition we saw Fantastic Mr. Fox with the Spendloves. I went the day after Thanksgiving with my brother, Rich and his wife, Amy,and my sister, Jodi and her husband, Naaman, to Nephi to visit my sister, Marci, who had her sweet little baby, Makinlee, 3 weeks early! Ashley and Cami were good enough to tend for all of us (11 little kids) while we made this excursion. Saturday night Jodi and I made an extra trip to Nephi to spend the night with Marci in her hospital room when we found out Makinlee was having difficulties and needed to be transported to a hospital in Provo. We didn't want her to stress and worry alone. Then Sunday morning after an uncomfortable night spent in a hospital recliner, I wrote a talk in the hospital parking lot and drove home just in time to speak in Sacrament meeting with the family in our new ward. The craziness has continued in December! An opportunity to take a CNA class for free presented itself and I seized it! During the first 3 weeks of the month I spent 54 hours in class and 24 hours at a nursing home doing clinicals. I was super busy but I loved it! It was a thrill to be back in a learning environment. I did miss class one evening in order to celebrate Noelle's 11th birthday! I took my final and finished the course on the 17th. Then it was a mad rush to make up for lost time and prepare for Noelle's birthday party with friends, Faith's 1st birthday, and of course, Christmas! (I'm thinking that since December 21 was kind of a blur, I shouldn't have to add another year to my age! Am I right?) Thankfully, we had a very merry Christmas! And life has finally slowed down enough for me to catch my breath just in time for 2010!